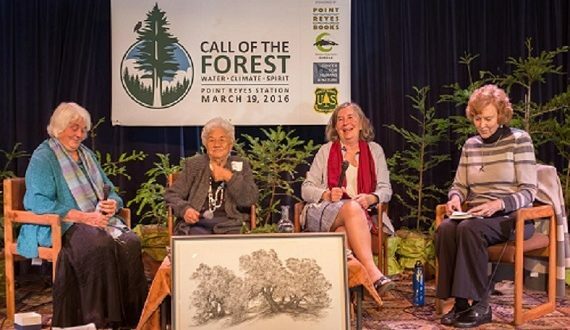 Call of the Forest: Climate, Water, Spirit panel (L to R): Mary Evelyn Tucker, Joanne Campell, Diana Beresford-Kroeger, and Wendy Johnson. Photo 2016 by Elizabeth Fenwick for Point Reyes Books. I have been in the arms of the Redwoods again. 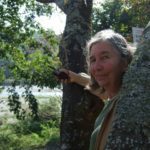 These carbon giants live in California: many green menopausal matrons hang around Point Reyes, in the Samuel P. Taylor State Park, in particular. So, I rudely passed Mia Monroe, park ranger extraordinaire and the masses gathered to hear us talk, to link up with my trees. You see, I was thirsty for their actual presence. I can only recall their images in dreams. Nobody was going to drag me away from greeting them in person. 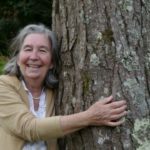 In reality, I am being accused of being a tree-hugger and there is nothing bigger to hug than a redwood, they are the kings of the conifer forests – the great beating heart of America. These redwoods hold a green passport into the future to stop climate change. I walked across the solid platform of the ancient tree trunk cut a hundred years ago. It was covered with brown foliage and small twigs. The layer was a few inches in depth. The circumference was over forty feet, as big as any living room. From the edges of this ancient redwood, the miracle of vegetative growth had produced sucker trees that were enormous. Each one tickled the sky going for their full height of 400, or so feet. They were busy gathering big bundles of silence into themselves. I placed my head against one tree. It nestled into a large wooden valley, like an egg into an eggshell. And all at once I was transported into that silence of the soul, where nothing matters because it is a place of emptiness and emptying. Time holds no mastery in the space of the mind, only the divinity of the sacred runs riot. I stepped backwards. And, I was at one with the world, again. 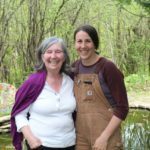 The day before the conference of “Call of the Forest: Water, Climate and Spirit”, sponsored by the US Forest Service, Black Mountain Circle, Point Reyes Books and the Center for Humans and Nature screened our film. Under normal circumstances I am a scientist and a writer. But at Point Reyes Books, I was sitting in the audience, shoulder to shoulder, looking at my work of the past five years. I will admit that I had a death clutch on Merit Jensen Carr our Executive Producer and another invisible stranglehold on Jeff McKay, the film’s director who was not present. I was not prepared for the standing ovation we received at the end of the film. I was not prepared for the huge audience who were crying. And, I was definitely, not, in any way prepared for the warm and heartfelt hugs I received afterwards. People, the young and the old, told told me that “Call of the Forest: The Forgotten Wisdom of Trees” had changed their lives. Now they had answers for climate change and they did not know that trees had such an important function for the life of the planet. The film was beautiful. The music was fantastic, and the soundscape exquisite. So, in the next few hours we heard from the water panel and the climate panel. Then at 3:30 pm we moved to the spirit panel with myself and sculptor Betsy Damon. We were joined by a force of nature, Mary Evelyn Tucker. She spoke in the language of environmental religion with words from the Jesuit Teilhard de Chardin who had trekked through Outer Mongolia, scattering tidbits from Lao Tsu and other religious hermits of China. Confucianism was the icing. And of course I added the ancient wisdom of the Celts. Whereupon my uncle and mentor who adopted me in Ireland as a young orphan, was honoured by calling his name, Padraig O’Donoghue, three times. The audience did not know that refrain in triad is an ancient sacred honour…wonderful! So, you can see the state of affairs. I am still very excited by California and energized that my books and messages for a climate cure are on the way. I was filmed and recorded for the three days, there will be all kinds of goodies on the internet soon and also in the April 2016 edition of “The Internationalist”, my article in healing aerosols. 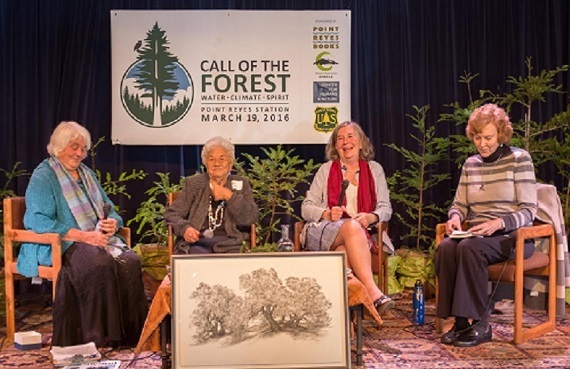 Many thanks to our friends at Point Reyes Books, Black Mountain Circle, the Center for Humans and Nature, the US Forest Service and the Entrekin Family Foundation for organizing the event “Call of the Forest: Water, Climate, Spirit”.